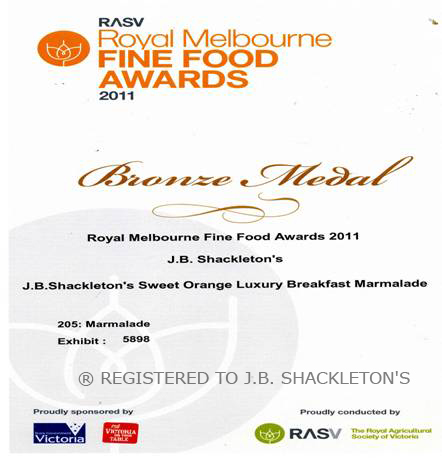 Continuing the international winning streak begun when its classic Breakfast Marmalade was awarded Gold in 2012 - as reported in the AGE Epicure at the time. 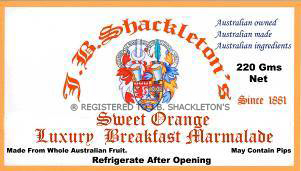 The Wonga Park family firm of J.B. Shackletons has just pulled off a hat trick at this year's World's Marmalade Competition in England in the Artisan & Commercial Makers Class. They scooped no less than three major Medals - Gold for Luxury Lime and Silver for their Cumquat and a Silver also for the new line of Lemon Jelly, with an additional Bronze and two Commendations. 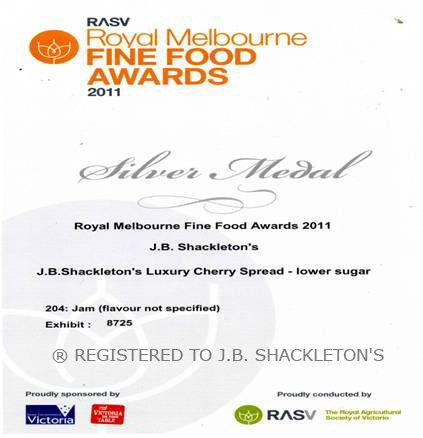 JBs won more medals than any other entrant world-wide in the "Any Citrus Marmalade" Class. 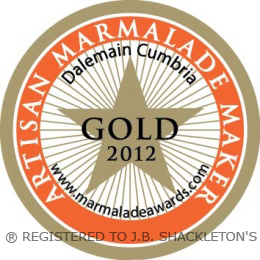 Their Cumquat Marmalade was the only Cumquat Marmalade that won a medal. There were more than 2000 entries from around the world in this growing and prestigious competition. 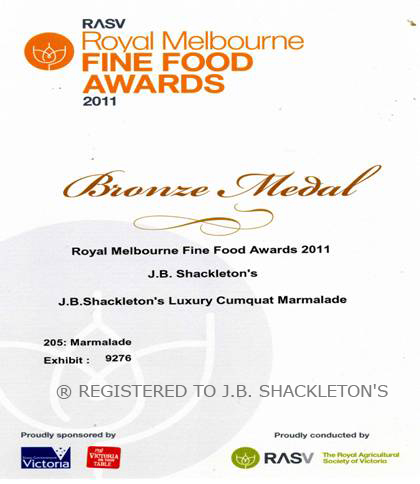 These Marmalades are all made in Australia using all Australian ingredients! "At Chateau Yering we make everything from the ground up including jams, chutneys and relishes so usually when someone contacts me about selling me these products I normally don't go out of my way to try them. But when Lachlan contacted me about his range of produce his enthusiasm and passion was infectious and he told me about the story behind these recipes that had been in his family for generations. So I had to have a look at his wares. My Pastry Chef Nardia Kitch and I sampled Lachlan's beautiful produce. 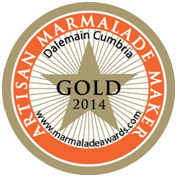 We were excited with the quality and how not run of the mill a lot of the flavours are like the Lime Marmalade and the Walnuts in Cherry Jelly. The Panforte is full of beautiful warm spices and the Walnuts in Cherry Jelly is currently on our cheese trolley and we constantly get great feedback and is certainly my favourite condiment to have with cheese. It has a clean cherry flavour with great texture from the walnuts and is quite unique." THE ROYAL MELBOURNE FINE FOOD AWARDS - 2011.